Agate and Smoky Quartz Necklace. Contemporary Jade Gemstone Triangle Earrings. 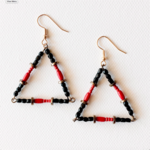 Contemporary Red, Black and Gold Triangle Earrings.